I just started a new job, and that, for me, usually means a total closet overhaul to meet the new HR guidelines. Luckily, it's a creative environment where ripped denim, crop tops, and sky-high heels are a common occurrence. So, for a stylish work outfit that'll have my co-workers talking about me at the water cooler for all the right reasons, I went to T.J.Maxx and got this head-to-toe ensemble — all for less than $100. A 9-to-5 look can turn on a great print dress like this one. While prints often can be loud or read girly, you can't go wrong with a classic black-and-white pattern. The material on this wrap dress is soft and easy-to-wear, so even if you're putting in overtime, you’ll still be comfy. A large, structured tote is an essential for work. You can toss in your sack lunch, a laptop, and the heels you're going to change into once you get into the office. Bonus points if you find one in an arresting color, like this cobalt blue. 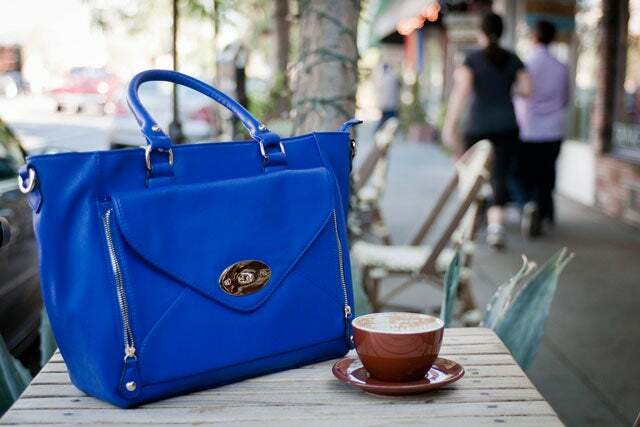 And, unlike a briefcase, this bag is chic enough for happy-hour drinks after work, so that you don't walk into downtown L.A.'s Seven Grand looking like you just stepped out of the office — even if you did. Are you sick of wearing your trusty black blazer to work every other day? Me too. You can swap in a black leather jacket, like this awesome dual-textured one I found at T.J.Maxx. It's perfect for a night out, but it polishes up this work-appropriate dress. Basic work pumps can be so ... basic. Step it up with a T-strap heel finished with suede detailing like these. They look profesh, go with everything, and can easily be worn on your days off. All clothes and accessories courtesy of T.J.Maxx.